Add dramatic support to your unruly garden plants with the Arboria Pyramid Cedar Trellis. Made from Western Red Cedar for exceptional durability, this structure stands 81" tall to lend stability to weaker plants in your garden when a traditional trellis isn't feasible. The base of the pyramid measures 23.25" on each side, allowing plenty of room to place this support directly over your plant. The plant then has nowhere to grow but up and out, weaving through the beams of the trellis. Western Red Cedar contains natural oils that retard decay and repel insects and fungus; it also has low shrinking and swelling tendencies and superior ability to hold paint. 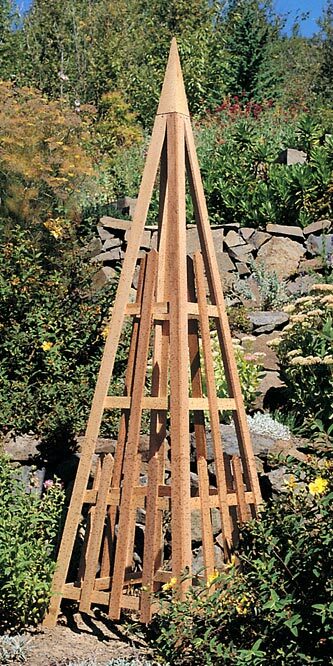 Bring the Pyramid Cedar Trellis to your landscape for architectural interest with a purpose. Some assembly required. Achla Garden Obelisk, Gray, 84.5"